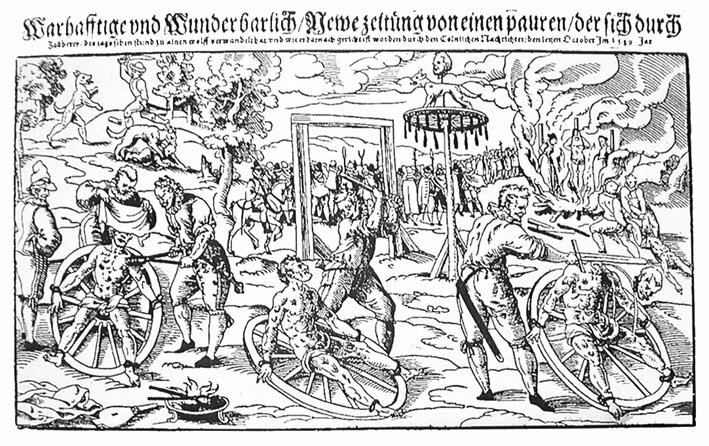 Composite woodcut print by Lukas Mayer of the execution of Peter Stumpp in 1589 at Bedburg near Cologne. Abstract: Traditionally criminology has regarded criminal actions as deriving from rational or opportunistic motivations. However, many crimes are still identified as seemingly ‘motiveless’. These frequently feature extreme violence and remorseless perpetrators. The aim of this essay is to adopt an investigation of medieval violence as a tool to explore the sentiments behind contemporary motiveless crime. The article reviews both medieval and contemporary sources. It argues that understanding the spectacle element in medieval violence can help us decode the ‘motivelessness’ in crime today. Introduction: In medieval Europe, torture was not just a form of punishment or a deterrent for serious crimes like treason, sexual violence, homicide and arson, but also a sanguinary, collective experience: ordinary people would gather together in order to witness the torments inflicted upon the criminal. The delinquent’s abdomen could be sawed when s/he was still alive, the body could be dismembered, eyes excavated, the agonizing body stabbed with incandescent pokers. A thrilled public would take part to this physical and psychological humiliation by insulting the condemned or cheering at the violence… a form of attraction for a society whose social life was based on mainly feudal and religious duties and where entertainment mainly occurred during restricted periods (e.g. festivals). In contemporary Europe, physical violence is no longer a form of ‘lawful’ control: oppression, segregation or social cleansing have all replaced violence, giving rise, at times, to violent forms of resistance. Society attempts to find motivations for that type of brutal crime that does not emerge as a consequence of unemployment, social inequality, political extremism or poverty; these are, in fact, not only regarded as the cardinal pillars of criminological discussions, but also the main crime explanations that Power finds it easy to engage with. Crime for crime’s sake is dismissed as ‘motiveless’. Is this really so? The aim of this essay is to explore how an investigation of violence in the Middle Ages can inform our understanding of ‘motiveless’ violence today. Has society moved away from the bi-dimensional relationship between deviance and entertainment?